This is the Solar Hot Water controller that was originally manufactured for Solar Power Australia but has since been taken over by Astivita Renewables. By agreement, SPLat have been authorised to sell replacement controllers. SPLat are not plumbers. We do not make hot water systems. 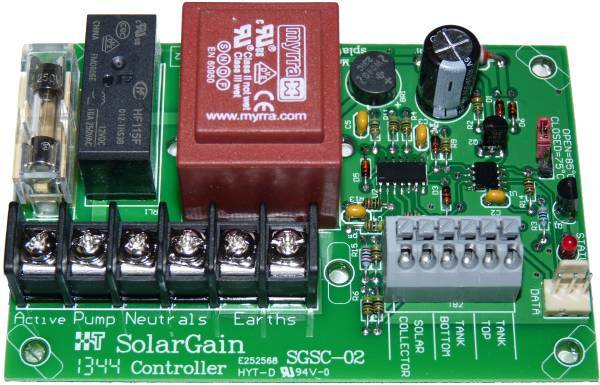 We were only asked to design and manufacture this controller by Solar Power Australia. We don't know how to replace your pump. We don't even know what a pump looks like. If you have a problem with your controller, we can sell you a new one but we can't fit it. We want to help you though, so here is some stuff that may help you or your electrician or your plumber figure out the problem. By the way, please ensure any work done with the controller is performed by a licensed electrician. Mains voltages are present and dangerous. This controller is not for new designs. It is only intended to be used as a spare part and is fully interchangeable with the SGSC-01. If you're an OEM seeking a new control solution, we have experience and can help. The required sensors are_NTC 10K Ohm 1% 3435 Thermistors. These are available from a varienty of sources including eBay , Alibaba, etc.